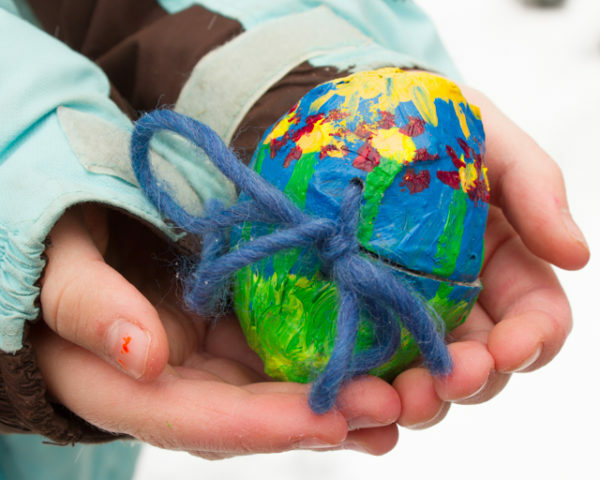 Yes, you CAN have an eco-friendly Easter! This springtime holiday is perfect for nature crafting, and an Easter basket is a terrific spot to put a few special homemade gifts. Easter eggs are so easy to make eco-friendly, and some wholesome treats are a terrific way to counter that morning candy-fest. 1. Upcycled Easter wreath. 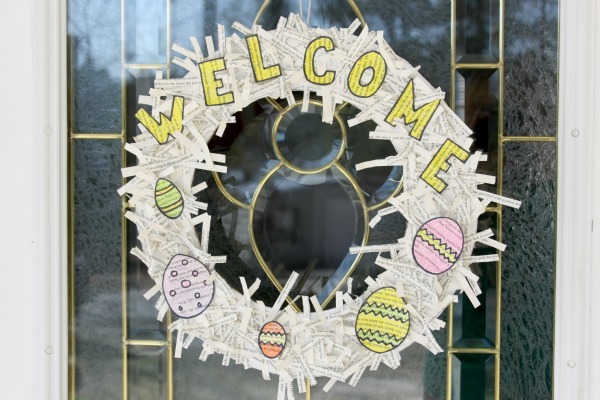 When you’re shredding old book pages or newspaper to make your own grass for Easter baskets, set some aside to make this upcycled wreath, perfect for welcoming guests to Sunday brunch. 2. crocheted Easter basket. A crocheted Easter basket is the perfect place to put lots of homemade-with-love Easter gifts! 3. fabric Easter basket. Most of the Easter baskets marketed to children in stores are plastic, which is just… no. 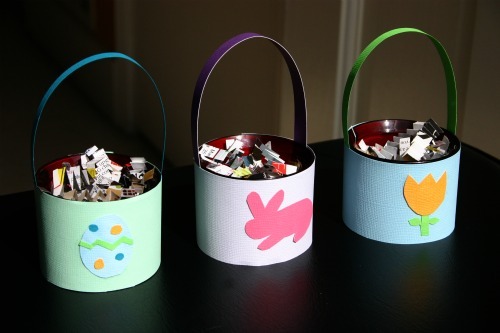 Thrift a nice woven or wicker one, or make these sweet sewn fabric Easter baskets. 4. pom-pom bunny. Here’s a versatile craft that will work with any yarn. Cotton and wool are the most eco-friendly, but hey, if acrylic is what you’ve got, then it works fine, too. 5. pom-pom bunny garland. Once you’ve got the pom-pom technique down, you can also make this sweet pom-pom bunny garland. 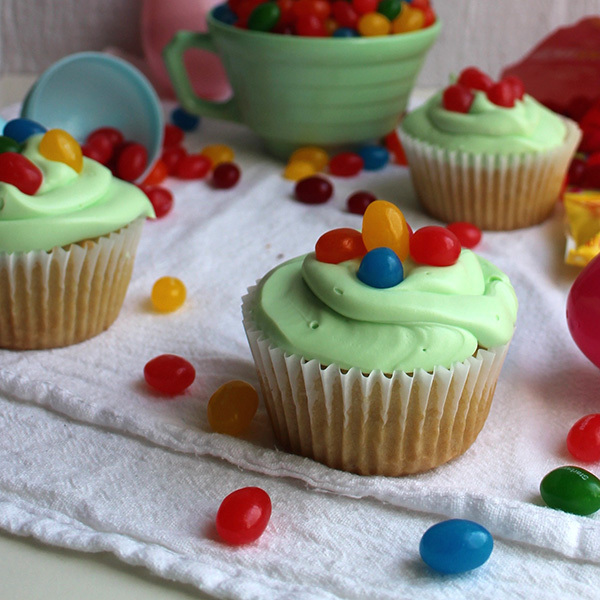 6. vegan Easter cupcakes. Skip the eggs and milk and butter and still make a batch of decadent Easter cupcakes. 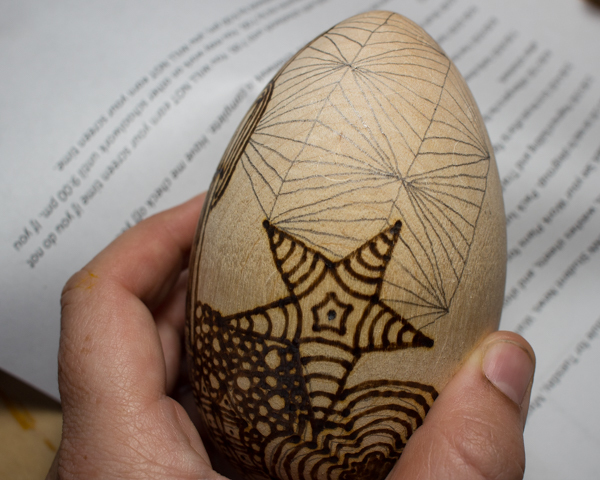 7. dimensional Easter egg ornament. You can use up lots of little scraps of paper for these Easter egg ornaments; the result is an Easter decoration worth saving, but also easily recyclable. 8. felt Easter eggs. These are sturdy enough to hide for an egg hunt and yes, they do have a pocket for a treat! 9. Mason jar Easter baskets. I love this idea for dividing treats bought in bulk among multiple kids. 10. washcloth bunny and chick. Here’s an adorable way to sneak something practical into a kid’s Easter basket. 11. chalkboard Easter eggs. I LOVE these Easter eggs! 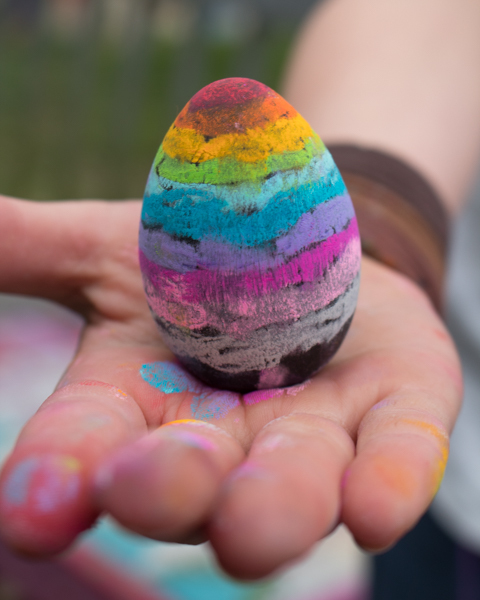 Add chalkboard paint to unfinished wooden eggs and you’ve got an Easter egg that you can decorate over and over again. 12. felt bunny and chick Easter baskets. These baskets are perfect for someone who likes a little hand-sewing, although you could glue the embellishments on and they’d still look absolutely adorable. 13. kidney bean bunny wreath. This tutorial does use Styrofoam, but it’s Styrofoam that’s upcycled from packaging waste. If you don’t have any on hand, use newspaper instead. 14. potato stamped Easter eggs. Potato stamps are a fun and easy way to create a wide variety of Easter eggs. Even kids can safely carve a potato stamp, and it’s a great way to experiment with patterns and colors. 15. tin can bunny planters. Instead of craft foam, cut apart a soda can and cut the aluminum into the shape that you need. Sand the edges or wrap them in duct tape to make sure they aren’t sharp. 16. candle jar miniature Easter basket. Votive and jar candle containers often have the perfect Easter basket shape–just cover them in festive decorated paper and fill with tiny treats! 17. clay Easter egg garland. This is such a simple decoration, in which even the clay is homemade. 18. felt bunny treat bag. There’s an eco-friendly type of felt for every type of crafter, so felt projects are always a great choice. 19. felt carrot pencil holder. This bunny-themed pencil holder makes sitting through a long church service or Easter lunch much more festive and entertaining for a kid. Just don’t forget the blank paper! 20. wood carrots for the yard. Some woodworking skills are required for this project, but the materials are all reclaimed fence posts and pallet wood. 21. Woodburned and watercolor-stained Easter eggs. Want to get away from plastic Easter eggs but you don’t want to lose those beautiful, vibrant colors? THIS is the tutorial for you! 22. decoupaged Easter eggs. Here’s a great way to re-use the tissue paper that often comes in packaging and presents. I like that you can use real or faux eggs with this method. 23. Easter bunny stuffie. If you’re trying to avoid a lot of store-bought Easter basket fillers, then homemade toys and stuffies are for sure the way to go! 24. sock bunny. A sock bunny is even easier than a sock monkey. 25. tissue paper decoupaged Easter eggs. This is a more kid-friendly tissue paper decoupage method, specifically geared towards those scrips and scraps of vibrant craft tissue paper that you might find yourself with if you do a lot of art with kids. 26. cascarones. 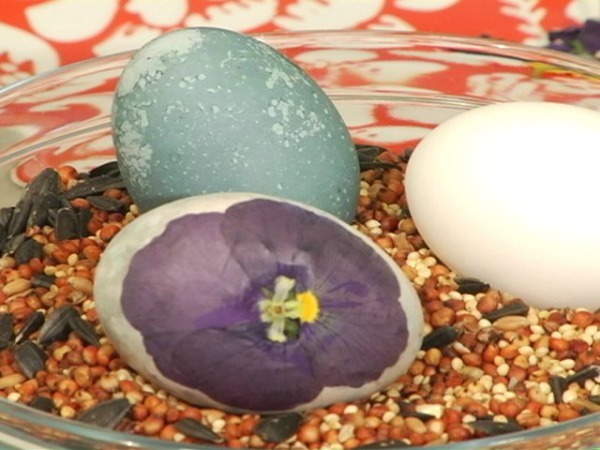 These traditional eggs are all-natural, and they’re FUN! 27. embroidered eggs. You have to have some time on your hands to make these embroidered Easter eggs, but they’re worth it. 28. toilet paper tube miniature Easter basket. These little baskets are perfect for holding just a few treats. If you’re hosting an Easter party, children could even decorate them themselves. 29. toilet paper tube bunny. 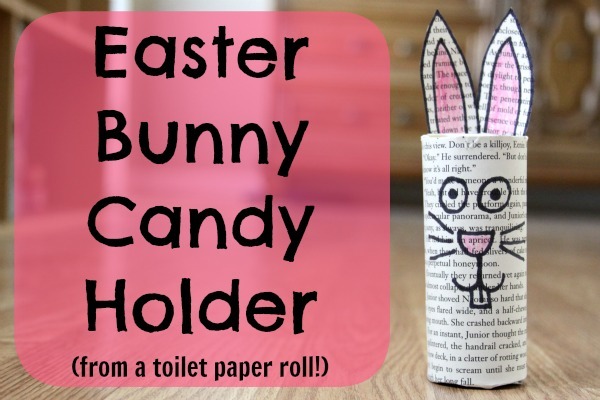 Kids love making holiday crafts, so you know that they’ll love making these Easter bunnies out of toilet paper tubes. 30. tree branch Easter bunny. Turn a fallen branch into this adorably rustic Easter bunny. I love that you can make any size you like, all based just on the size of the branch. 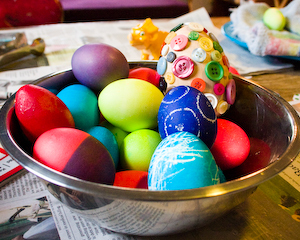 31. natural Easter egg dyes. If you don’t use artificial food dyes, there’s no need to buy them just to decorate Easter eggs. There are so many beautiful, natural options! 32. “Bunny Crossing” sign. This particular project upcycles fence pickets, but you could also reclaim pallet boards–either option is free and eco-friendly. 33. chick Mason jar vase. Upcycle an old Mason jar of spaghetti jar into a sweet chick that matches all the daffodils you can fill it with. 34. cement Easter eggs. Here’s an Easter egg that you don’t have to worry about a little one breaking. I love that you can still paint and embellish these–they’d be perfect for an egg hunt! 35. egg carton bunnies. These also hold treats, so you can replace some of your Easter eggs with them. 36. papier mache Easter eggs. 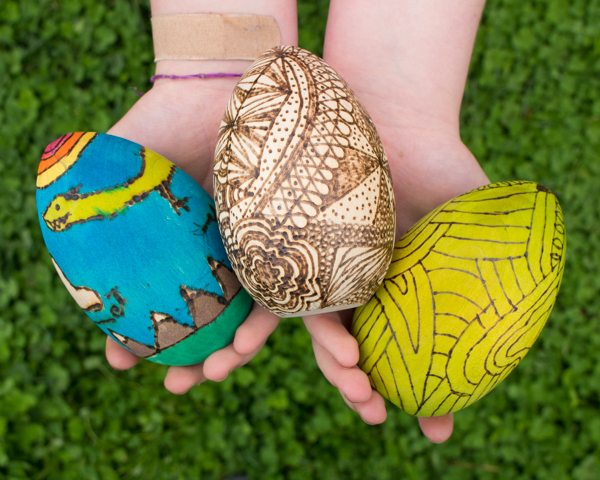 These papier mache Easter eggs are a full replacement for plastic Easter eggs, since they open for a treat. And just like plastic Easter eggs, they’ll also last forever, but unlike plastic eggs, these babies are just upcycled paper, glue, and paint. 37. cereal box and fabric bunting. Check out how beautiful this bunting is! Cereal boxes may have gaudy colors and marketing messages on the front, but on the inside, they’re perfectly blank canvases for your creativity. 38. reclaimed wood Easter bunny. I love that you can upcycle whatever you have on hand into this stand-up Easter bunny that’s perfect for a porch. 39. reclaimed wood Easter egg. While you’re at it, why not make some matching Easter eggs? 40. yarn-wrapped chick. Wrapping yarn is a good fine motor activity to strengthen little hands, and it’s WAY less messy than paint. 41. toilet paper tube Easter bunny. This cute Easter bunny is easy to make completely from upcycled materials. Use it as a candy holder or simply as a fun decoration. 42. button Easter egg. I bet that you can wrangle up enough buttons from your stash to make this button Easter egg. 43. felted wool Easter eggs. If you craft with wool, you’ll love these fuzzy Easter eggs that you can create from wool roving. 44. grapevine bunny wreath. The tutorial calls for faux vines, but I’m already knocking back the regular invasion of non-native plants on my property this spring. Wouldn’t it be fun to put those invasive vines to work here? 45. wood bead bunnies. These little bunnies look great when made with unpainted wood beads, but I think they’d look just as cute with any round beads that you have on hand. 46. embroidery hoop Easter eggs. I love this idea for Easter decorations, because you can easily take the fabric out of the embroidery hoops and store them between holidays–and then your embroidery hoops are ready for embroidering again! 47. bunny ear hoodie. This project doesn’t take a ton of sewing skills, but it LOOKS like it does. All you have to do is cut the ears off of a stuffed bunny and stitch them to your hoodie’s hood, and boom–you’re a bunny! 48. crochet Easter bunny garland. I love the look of this Easter bunny garland, but you can also crochet the bunnies as singles. 49. eco-friendly Easter grass. Plastic Easter grass is the WORST. Don’t submit to it, especially not when there are so many eco-friendly options that are even more beautiful. 50. eggshell votive candles. These candles are so versatile–you can dye the eggshells or leave them plain, or even peel off the eggshell for an egg-shaped candle.